Reversing Wrist Tendonitis is what you want to do if you have pain and other symptoms of Tendonitis of the Wrist. Tendonitis of the wrist, just like Tendonitis anywhere in the body, is a progressive dynamic of increasing muscle tightness, increasing connective tissue constriction, and an increasing Process of Inflammation. Doesn't that just make you mad that nothing your doctor prescribed to you helped? I created the ebook 'Reversing Wrist Tendonitis' as a How To Guide to get you OUT OF PAIN. Maybe you've even had surgery. The good news is, for MOST people, Wrist Tendonitis is a simple thing to take care of. Do You Know How To Make Wrist Tendonitis Go Away? Wrist Tendonitis is a PROGRESSIVE dynamic of increasing tightness, constriction, inflammation, and pain. You can REVERSE the progressive dynamic, and make your structure work happily and healthily again. Reversing Wrist Tendonitis is the way to 'fix' your wrist pain. Immobilizing your wrist won't work. That's just not how the body works. Surgery might help, but how does surgery reverse a dynamic of tightness, connective tissue constriction, and inflammatory reaction to pain? And did you know that you can have Wrist Tendonitis pain without any actual damage? How will surgery fix that? Will The 'Reversing Wrist Tendonitis' Program Help Me? If you follow the plan in the ebook, it WILL work. You're going to learn an incredibly valuable lifelong tool you can use to keep yourself out of pain (whether it's the wrist or elsewhere, the concepts are the same). I'm not much of a sales guy, but here's why you may want to consider purchasing the 'Reversing Wrist Tendonitis' ebook. Hey, I want to thank you. You've help my arms so much, every email you send is like gospel, and "Reversing Wrist Tendonitis" is fantastic. I'm a software engineer, and you've given me the ability to type again. At 58 pages, there is no fluff, no filler, no long thesis. Some products out there are a package of 6 dvds and a thick instruction manual and workbooks and audio recordings, etc. That's great if that's what you're looking for, but this product is for people that want a get-to-the-point walk-through showing you how to reverse your Wrist Tendonitis symptoms. ** You save time, you don't waste time, and you learn exactly and ONLY what you need to know. What you get with the 'Reversing Wrist Tendonitis' program now affects the SOURCE of your pain and problem. ** Imagine doing some selfcare for a week or three and then having to work REALLY HARD to notice any of that pain/tightness that's been bothering you for months and/or years. I could charge more, the information in the book is certainly worth more than thirty bucks, and if I can help a lot of people get better at this price, then that totally works for me. I spoke this week with a woman that spent $1,000+ on twenty sessions of acupuncture and got no relief. This program will normally be priced at $39.97. That's a great deal. And now you can save $10 more! ** You save money, and you get tons of value. You could have the ebook part of the program in front of you in the next ten minutes, and by the end of the day you could be taking actions that will actually have you feeling better. ** No shipping and handling to pay, and no wait. If you ever lose your copy, I'll replace it for free. 5. NEW! Support Email Series. The problem is, Wrist Tendonitis just doesn't work that way. There is no magic pill or miracle drug that will fix your wrist. Any product that offers an effortless cure is INCREDIBLY unlikely to beneficially affect the CAUSE of your Wrist Tendonitis dynamic. Perhaps you won't buy this program because you don't like the idea of having to put some work into it. That's fine, there's no reason to buy it and then not do the activities, so you just saved yourself $30! 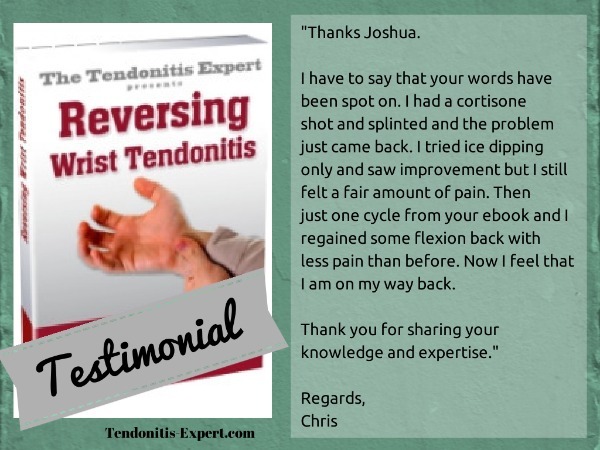 Get the 'Reversing Wrist Tendonitis' ebook now!